Can I listen to Dr. Demento shows online? 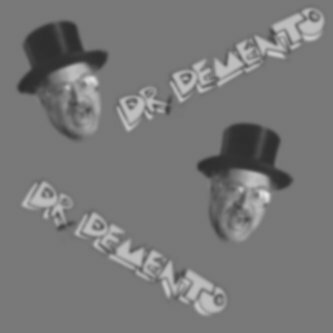 You can hear current and classic Dr. Demento shows online right here. There are hundreds of shows archived, and we expand the show selection on a regular basis. See also the streaming FAQ. I bought a show, now how do I listen to it? You should receive an e-mail immediately with details. If you do not get the e-mail, please check your spam folder. For more details, please see this page. Can I reach you by e-mail? By all means. You will find the address here. How can I buy recordings heard on the Dr. Demento Show? Many of the most-requested songs are on my various Rhino label CD's and tapes, available in stores or from my store. Lots more are on the Basement Tapes CDs and cassettes available exclusively to members of the Demento Society. Larger and more specialized record stores will usually have a COMEDY section where major label releases by such artists as "Weird Al" Yankovic, Ray Stevens, Tom Lehrer and Monty Python may be found. Ask the clerk where the COMEDY section is. Other demented discs may be filed under ROCK/POP, COUNTRY, OLDIES, etc. depending on the style of music. You can also find many comedy CD's at online sources such as Amazon.com and Barnes & Noble. Some of the newer songs heard on the show are on independent labels that are most easily obtained by mail order. The Demento Society News, mailed periodically to all active Demento Society members, contains addresses for many of these independent labels. Quite a few of the records heard on the show are older releases that have gone out of print. Many may still be found, however, at stores carrying used records. Look in your local Yellow Pages and you may well find ads for stores offering "hard-to-find," "out-of-print" or "collectors'" records. Several magazines for record collectors contain ads for dealers who sell rare records by mail. Look for Goldmine (700 E. State St., Iola, WI 54990) and Discoveries (100 Bryant St., Dubuque, IA 52003). One mail-order dealership I especially recommend for its huge stock of novelty 45's is Saturday Night Records, PO Box 60113, Chicago, IL 60660. Can I buy copies of your shows on tape? Alas, I cannot sell tapes of radio shows, due to copyright laws covering the records I play. I have a funny song. Can I send you a tape of it? I'm always happy to listen to original funny songs (or parodies). I get quite a few each week, and play the best ones on the air. Simply send your song(s) on CD, DAT, cassette, reel-to-reel, or vinyl to the address above. If there are more than four songs, please indicate which ones you feel are most appropriate for the show. Allow some time, as I listen to each one personally. You can find the address to mail it to here, or you can use my e-mail address there. I encourage you to copyright your material before sending it to me or anyone else. I can't find your show anywhere around here! What gives?